Product #46000 | SKU DT85S | 0.0 (no ratings yet) Thanks for your rating! 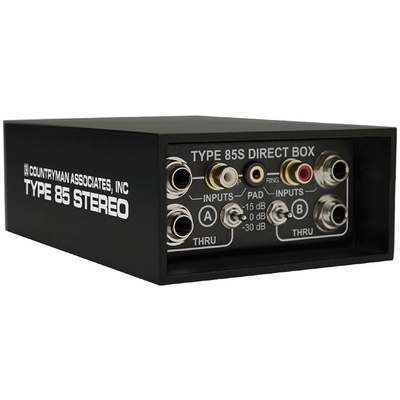 The Type 85S Stereo Direct Box from Countryman can be used to connect the output of any high impedance instrument, such as a keyboard or guitar, to a balanced XLR microphone input, allowing you to send signal to a mixer or mic preamp from your high impedance instrument. It features a 1/4" and RCA input per channel, as well as a gold-plated stereo 1/8" input. The unit also has two 1/4" throughputs, allowing you to run a high impedance signal to an amplifier. The two balanced XLR outputs allow you to run your signal to any standard mic level input. Its two channels of FET based Class A amplifiers were designed to emulate the sound of a tube microphone preamplifier with smooth overloading, reducing distortion at high levels of input. This allows the Type 85S to avoid phase inversion, which can alter the fundamental frequency of the source. The Type 85S features two channel independent ground lifts, which can reduce hum and electrical interference. The unit also has a 0dB, 15dB, or 30dB selectable pad per channel and is powered by external 48 volts or a nine-volt battery.